An exact replica of the original model. As seen in the Böker cutlery catalogue, New York 1906. Particularly edge-retaining premium quality from Solingen. Handmade using more than 150 work stages. Always unique, with elegant real gold etching. In an elegant box with extensive accessories – also exquisite as a gift. For a perfect shave: Beard care with the Original King Cutter – style from 1906. Detailed replica, with real 24 carat gold etching. Complete set with all accessories. By Böker, Solingen. 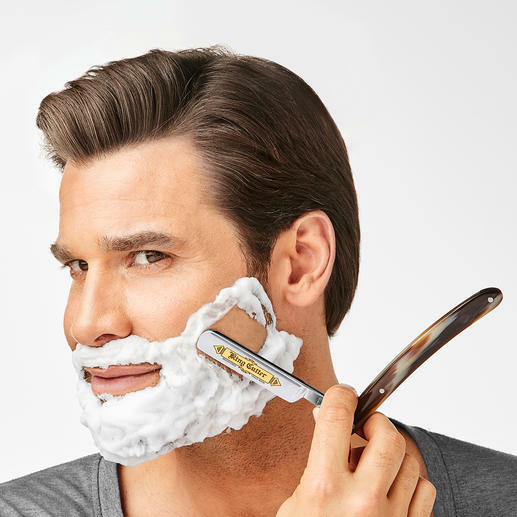 Buzzing electric razors and wet safety razors are rubbing and scraping millions of times across men’s faces. A daily procedure that not always satisfies the user. 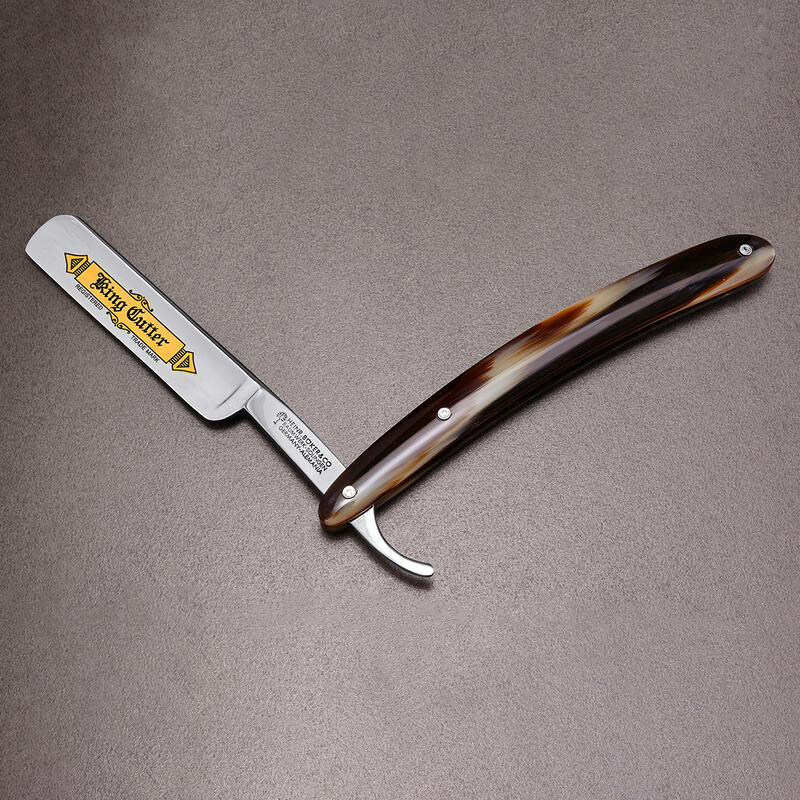 However, the classic wet shave using an extremely sharp blade is very different. Admittedly, you have to be wide awake so that you won’t leave your bathroom with any cuts. Plus, a thorough shave may take a little longer. And still, this method of shaving is developing into a real trend. With some practice and focus, the morning ritual becomes a premium relaxing, nurturing sensation. Especially if you use the cult blades from the specialist, Böker. 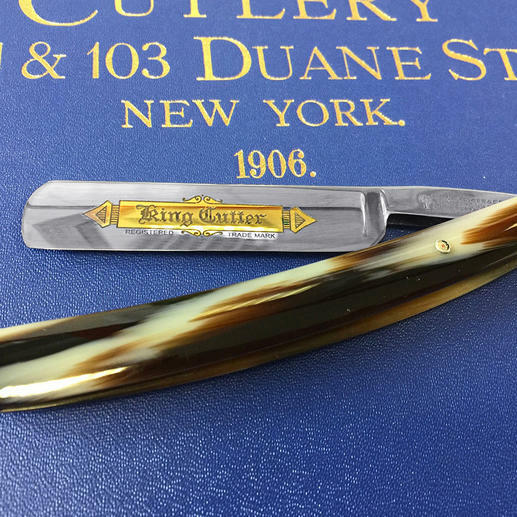 In the United States, the model was highly popular and a key part of the product range from the manufacturers in Solingen. Now, with the new barbershop trend, the King Cutter has been reissued, true to the original and made by the same company. The blade is made of the best, particularly hard Solingen razor blade steel (1.2210 carbon steel with a hardness of 59 HRC) and delivers a shave that is professional, effortless and precise (always dry the blade after use to prevent rusting). The extra hollow-ground blade is carefully prepared by hand: The highly sophisticated, extremely thin edge can only be achieved by skilful masters of the art. 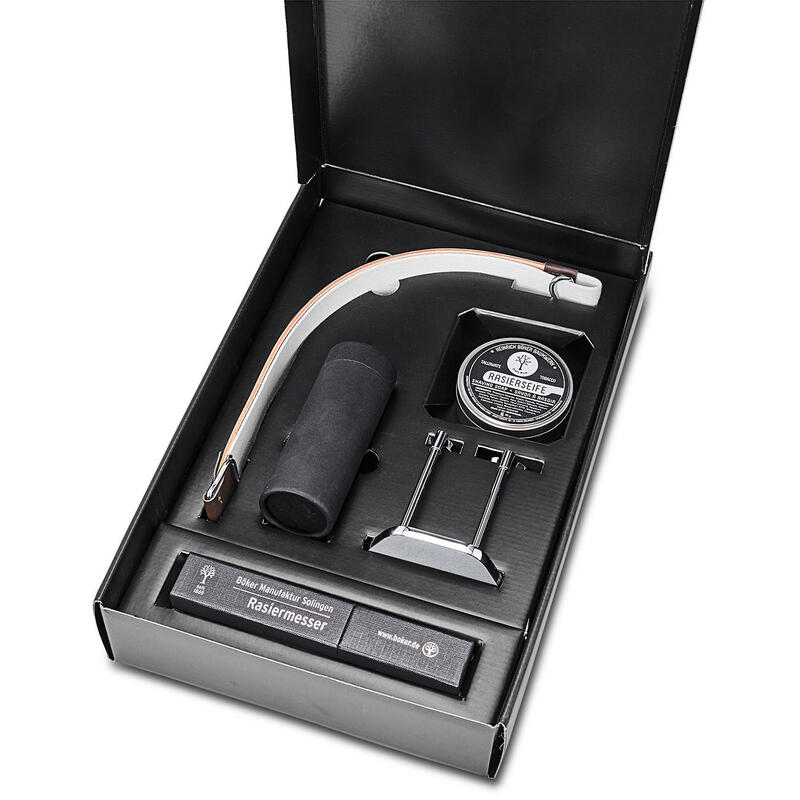 Flexible and easy to guide, the blade adapts to the shape of the face perfectly and ensures an impeccable shave. Furthermore, the blade can be sharpened on the strop, even by novices. 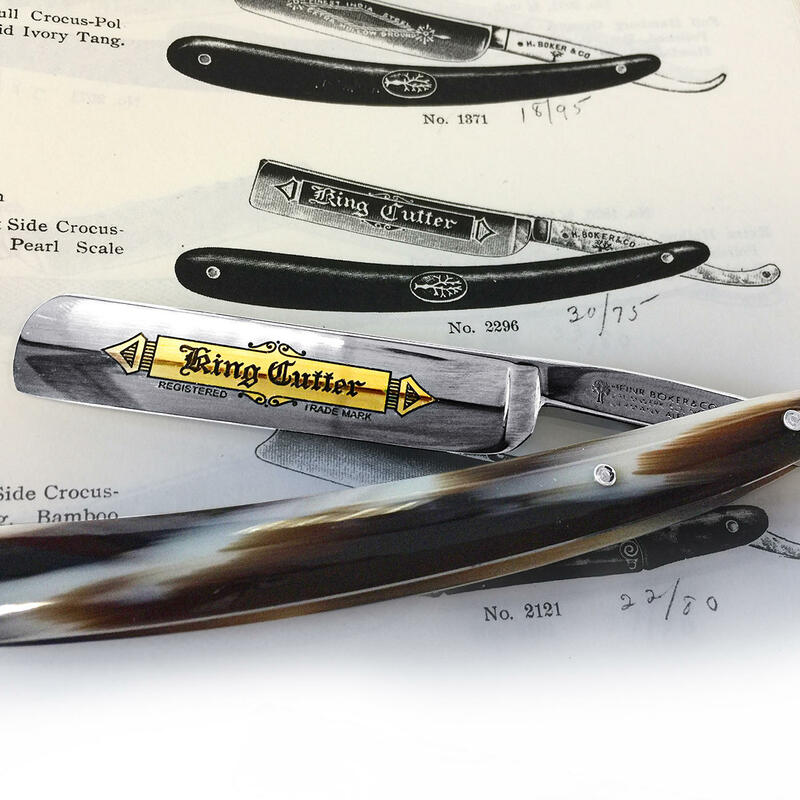 The blade is embossed with real 24 carat gold etched “King Cutter” lettering, which is diligently polished to a high gloss. The robustly riveted grip is made of the most beautiful, brown faux horn. A comfortable and skin-friendly material that sits securely in your hand thanks to its curved shape. 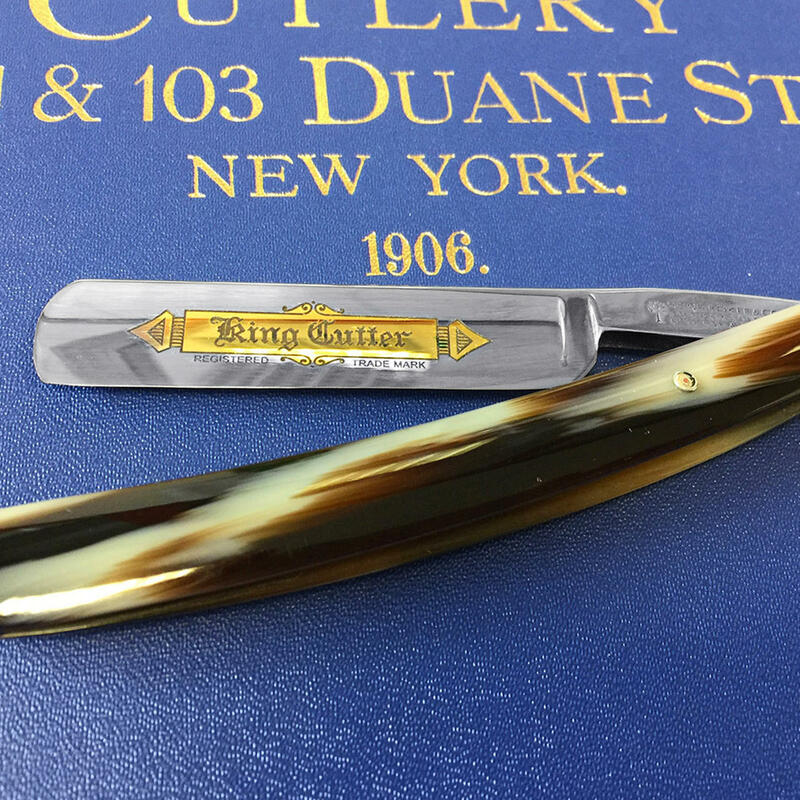 In addition to the King Cutter, the case contains a Böker shaving brush made of the finest silvertip faux hair. Exclusive to Pro-Idee: the handle made of brown faux horn, adapted to the knife. Size 11cm (4.3") H, 5cm (2") diameter. Weight ca. 100g (3.5oz). The stainless steel stand keeps your equipment at the ready in style. Size 8.5 x 6 x 9.5cm (3.3" x 2.4" x 3.7"). Weight 250g (8.8oz). The Böker beef tallow-based (tallowate) shaving soap with an aromatic tobacco scent is wonderfully soft and creamy. 70g (2.5oz) in a nostalgic tin, 7.5cm (2.9") diameter. 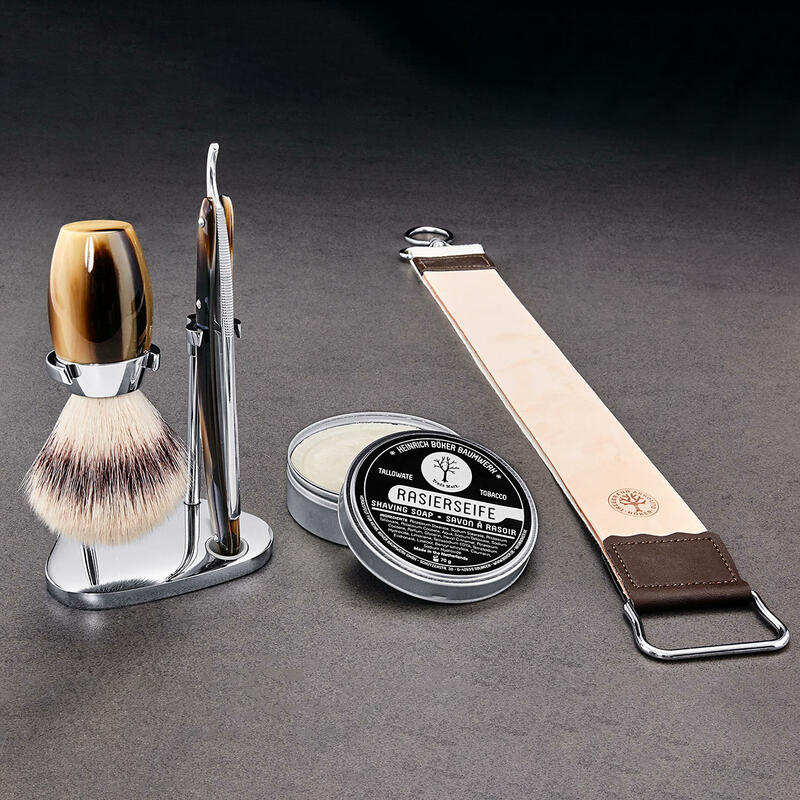 The classic leather strop keeps your King Cutter impeccably sharp – gently and carefully. Made of 3mm (0.12") thick cowhide leather, with silver-coloured metal mounting. Size 46 x 5cm (18.1" x 2"). Weight ca. 90g (3.2oz). Measurements King Cutter: 24 x 1.8 x 1.3cm (9.5" x 0.7" x 0.5") (open); 16 x 1.8 x 1.3cm (6.3" x 0.7" x 0.5") (closed). Weight ca. 40g (1.4oz). Clean with a soft cloth. Gift box: 36.5 x 24 x 7cm (14.4" x 9.4" x 2.8"). All measurements: L x W x H.